"My Brazilian friend makes this for me occasionally and it is fabulous!" Heat 1 tablespoon vegetable oil in a skillet over medium heat, stir in garlic and onion, and cook a few minutes until the onion softens and turns translucent. Remove the onion, and place into a saucepan. Pour the remaining 1 tablespoon vegetable oil into the skillet, and place over medium-high heat. Add cubed pork, and cook until well browned. Meanwhile, pour 3/4 of the black beans along with 1/4 cup water into the bowl of a blender, and pulse until finely chopped, but not quite smooth. 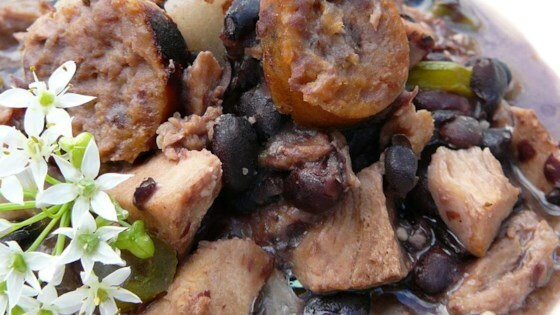 Pour whole beans and bean puree into saucepan along with pork cubes, chicken stock, chorizo, and bay leaves. Bring to a boil over medium-high heat, then reduce heat to medium-low, cover, and simmer 30 minutes. Season to taste with salt and pepper before serving. Nice taste, easy to make. Too much liquid though, I doubled the recipe but should not have doubled the chicken stock. Either that or add more beans. This was a wonderful stew and I really am not a stew eater. I made it one evening to serve for lunch the next day and I had two bowls of it before I went to bed. I could not put it down. This stew was good but needed more in it. I added a can of mixed beans and another can of blakc beans.